// The concat method will combine two string and returns the resulting string. // This will find the position of the substring in the given string. All the keys in an object must be a String. If it is not it will be converted to a string. If there are two key's with the same key-name the second one will replace the first one. console.log(numericKeyObj['234']); // will log the value in the console. console.log(numericKeyObj); // will also return the string value. You can access the object property in two styles. The Array Notation and the "." Dot Notation. You can see that we have used both in the above examples. // Creating a new object with the object literal notation. person['getDetails'](); // This will also work. There are actually two type of properties. Data properties and Accessor properties. Data properties are just to store data like String and Integer values. Accessor properties are methods that work with the data in the object. Every property is a named collection of attributes. Those attributes are as follows. For you to define an object with setting this bits you can use the following methods. 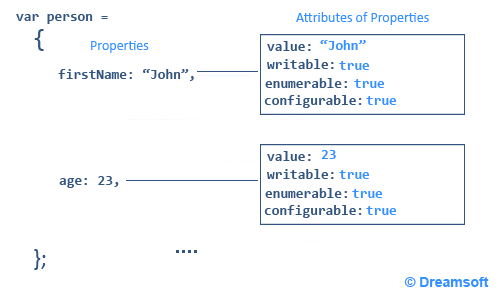 With defineProperty you can create a single Object property by passing the object to create the property for, the name of the property as key and the bits as an Object which is the third argument. defineProperties can be used to define multiple properties at once for an Object. This code does the same thing as the code shown initially to create the person object. It seems pretty complex, but it lets you modify the bits of the properties of the Object. The following is the code where the object is created by modifying the bit. In the strictPerson object you cannot modify the value of firstName and age. You cannot delete the firstName, location and getDetails. The getDetails() method won't appear in the for in loop. // will return "Scott", but the original value would not have been changed. // The value has not been changed, it is still john "John"
// will return false, since its configurable bit is set to false. // will list all the property value except the getDetails method. since enumerable bit is set to off. New in ES5: Object now can be created with the prototype of the object set to null. By default the Object.prototype is set to the new Objects prototype. I will discus in detail about prototype in the next series. Reflection is a method for inspecting the object properties. This can be done using the typeof keyword. typeof per.getDetails; // will return function. You can check if a Object has a property of its own by using the hasOwnProperty method. You can delete a particular property of an object using the delete" keyword. Note: If you need to know the methods available in an object, open the Google Chrome console or Mozilla Firefox console and type in the objectName and the list of available methods will appear.